Hurricane Palmetto incorporated transport services and medical facilities throughout the Lowcountry and Grand Strand to assist in hurricane preparedness. Hanahan, SC (June 18, 2018) – MedTrust Medical Transport, a premier provider of ambulance services in the Lowcountry and Grand Strand, successfully completed a hurricane evacuation exercise on Friday, June 15 and Saturday, June 16, 2018. The exercise, named Hurricane Palmetto, provided a real-time test of the evacuation response plans for partnered facilities throughout the Lowcountry and the Grand Strand. Hurricane Palmetto simulated a Category 3 Storm striking the South Carolina coast just south of Charleston County and moving north-north east across the coastline. It featured approximately 350 people from 19 organizations, including hospitals, emergency departments and retirement communities. This was the first such exercise to span multiple facilities from Charleston to Myrtle Beach. The participants conducted 160 separate transports over the two days. At its peak, 51 vehicles were deployed, transporting 102 patients at one time. Photos of the exercise can be found below. Hurricane Palmetto tested the process of needs assessment and communication for facilities during a disaster, including real-time patient tracking programs for facility leadership at each phase of the evacuation exercise. The exercise also validated evacuation response plans for local facilities, ensuring communication and evacuation plans are current and appropriate for the required response and facility evacuation. The facilities involved initiated their transport efforts approximately 24 to 48 hours in advance of the storm reaching land, simulating a response to the equivalent of a state-issued Medical Facility Mandatory Evacuation for Coastal South Carolina. In the event of damaging winds, heavy rainfall, and flooding a storm of this size would cause, all non-Hospital locations in the exercise are required to evacuate and not shelter in place. The exercise required facilities to coordinate evacuations, transportation of needed equipment and staff to assist with patients. When operating under a notice of mandatory evacuation by state officials, facilities must take actions to ensure a complete, accurate evacuation while maintaining the ability to accordingly track and care for their patients. Patients from facilities are often transported by different modes to other medical facilities in the area, region, state and adjoining states. Resource management, detailing facility requirements and their fulfillment plans, must be completed 24 hours prior to landfall. This exercise helps ensure that development and execution of those plans work smoothly should an actual storm warning be issued for the coastal region. In addition to serving as the organizer of the exercise, MedTrust managed the EMS providers, which also included Shoreline Medical Transport, Thorne Ambulance, and American TransMed. Helicopters provided by Air Methods, a leader in the air medical environment with nearly 40 years of experience in emergency air transport, simulated three critical patient transfers during the exercise. Among the volunteers serving as actors in the role of patients were members of the Girl Scouts and Boy Scouts from the Coastal Carolina Counties. Representatives of the South Carolina Department of Health and Environmental Control’s EMS Bureau and Public Health Preparedness Office observed the exercise as well as County Emergency Management Personnel. Zoll Medical provided technology solutions for the exercise, allowing for mapping, GPS tracking, transparent dispatch paging, easy online trip scheduling, and two-way communication between dispatch and crews, ensuring that critical information is communicated accurately and in real-time. Southeastern Emergency Equipment and Med-Tech Resource provided medical supplies. Verizon Wireless provided the communications network for the Emergency Operations Center. 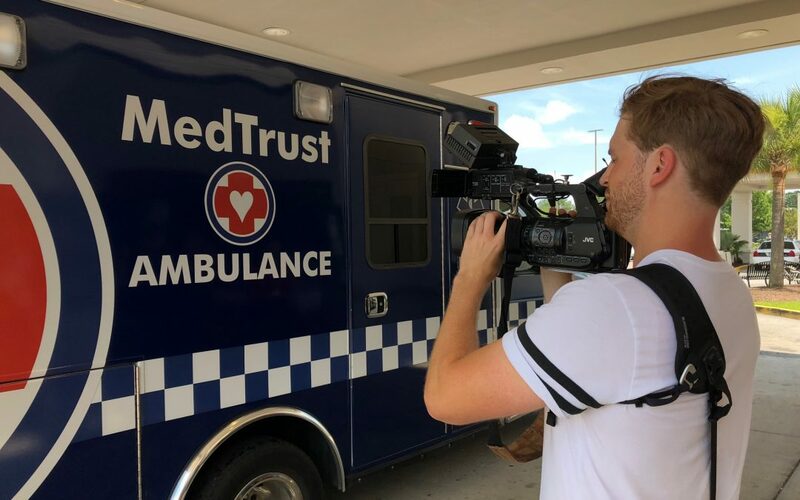 MedTrust Medical Transport is the fastest growing ambulance company in South Carolina serving the Lowcountry and the Grand Strand of South Carolina. Every day our Vision of Improving Patient Outcomes Through Excellence in Mobile Healthcare guides our trained paramedics (over 40% Critical Care credentialed), EMTs, and other professionals working together to provide the very best in Medical Transport. Each year we transport more than 30,000 patients in critical, emergent and non-emergent situations. More than 25 healthcare facilities and four hospital systems entrust their patients to MedTrust. Headquartered in Hanahan, with additional offices and bases in Moncks Corner, Walterboro, Georgetown, Murrells Inlet, and Myrtle Beach, MedTrust supports many community organizations and provides onsite and mobile medical support for local professional and college athletic events.